I’ve talked a little bit about how quickly this summer has passed… and I think that’s because for 12 straight weekends, we had plans. We moved, we visited family, we went to the beach with friends, we went to Maine, we went to two amazing weddings, and we hosted lots of awesome visitors. Then – amazingly, we had a weekend come along where we had no plans…and sometimes, that’s AWESOME. So – what’d we do? Well. We made great dinners, we slept late, and we went to a local farmer’s market. But that’s not all. 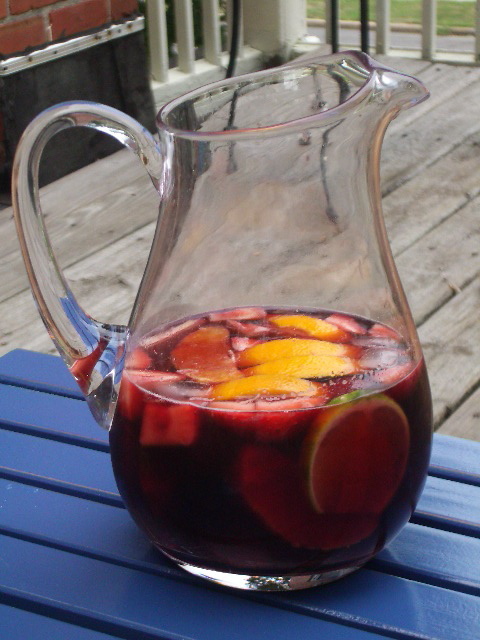 We also made this sangria, and then we sat on the porch with two glasses, our books, and our pup. And it was the perfect afternoon. I hope you can make this for me sometime soon!! !